September 17 – It was the most extraordinary of extraordinary Congress gatherings. After just 27 minutes the Asian Football Confederation ended their meeting whose main agenda item was to elect the region’s three additional members to the newly established FIFA Council. The only vote taken was to effectively disband the meeting. 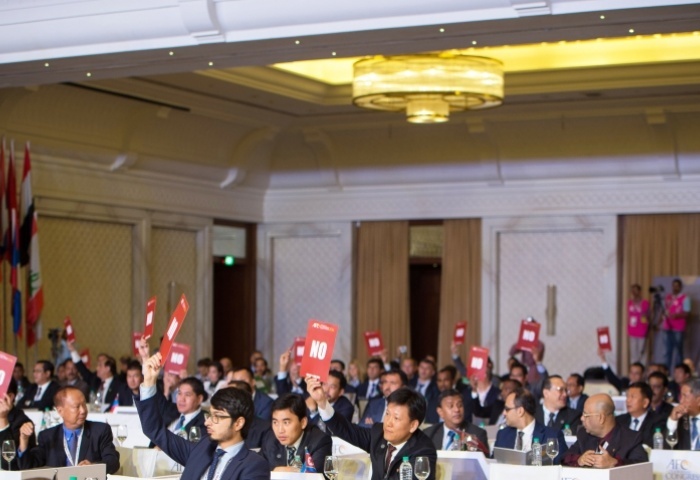 Surely a war against FIFA has never been so unequivocally declared as the Asian federations voted 42-1 against continuing with the published agenda, with one abstention. Tuesday’s unprecedented move in Goa, India, was triggered by FIFA’s 11th hour ban on Qatari Saoud Al-Mohannadi from standing for election because of an on-going ethics investigation and recommendation of a minimum two-year ban. FIFA has known about this for weeks but by the time the ban was issued there was no time for other candidates to enter the election. The message to FIFA and its marauding new executive elite could not have been clearer. Nor could the snub to FIFA president Gianni Infantino who had flown halfway round the world to be there. Whatever spin FIFA now tries to puts on the events that unfolded, the traditional politeness and reserve of the Asians has been fractured. Underneath, a unity and an iron will has been revealed that will not be manipulated or told how to run its business in its own region. The implications for Infantino and his regime are seismic. Rather than uniting world football behind a reformed, cleaner, progressive and more transparent governing body following the US Department of Justice football corruption investigations that plunged FIFA so deep into crisis, Infantino has created a new crisis of his own making. Such politically-driven manipulation has never before been exposed or expressed so emphatically within a democratic forum. He went on to pointedly bring Infantino into the debate. “But the Congress has spoken with one voice and that has been clear for us all to see. FIFA President, Gianni Infantino, I am not sure if you have been at a shorter Congress but I think you can see the strength of opinion in the room,” he said. To give the Goa debacle even more context, Salman, stood against Infantino in the FIFA presidential election. But to pass off the latest vote as some kind of political payback would be a naïve failure to recognise the key messages and issues at stake. Basically, the AFC administration were not prepared to be forced into electing Infantino’s preferred candidate through the banning of others. Following the Congress the AFC executive committee immediately went into emergency session after which Salman praised his members saying: “Today the AFC and Asian football has shown solidarity and unity. The message has been clear to everyone both inside and outside Asia. Exactly who in FIFA made the decision to stop Al-Mohannadi standing is open to some conjecture. Most fingers are being pointed squarely at new audit and compliance chief Tomas Vesel, once again raising questions about the integrity and independence of the whole of FIFA’s increasingly tainted ethics process – one that was generally respected (if not always liked) prior to Infantino winning the presidency. Trust in this process has now plummeted amid deeply held suspicions that the ethics committee is too frequently being used as a political tool to achieve a result desired by and favourable to its executive rather than carrying out transparent and fair investigations and coming to reasonable judgments. The AFC decision is not just a protest over the election ban of Al Mohannadi but rather the culmination of growing discomfort with what is viewed in the region as meddling in their affairs for the benefit of others. The one federation (surprise, surprise) to vote against the Congress walk-out was Singapore, who had their own candidate standing for election to the FIFA Council and who were one of the AFC nations who voted for Infantino in the FIFA presidential election. But it is worth noting that the traditionally dominant nations of Japan, Korea, Australia and, perhaps most importantly China, were all behind the group decision. China is a key nation for the new FIFA as its commercial power is most likely to be the governing body’s most important sponsorship cash cow in the coming years. FIFA has bent over backwards to accommodate the Chinese – but it is a convenience forged on financial ambition and president Infantino may now be realising that money doesn’t always have the power of discrimination he might have hoped. After the aborted congress the AFC executive committee co-opted China’s Zhang Jian – a candidate in the FIFA Council election, but understood not to be FIFA’s preferred candidate – to sit on the Committee until the next Extraordinary Congress. The AFC will now engage with FIFA to establish the timeline for convening its next Congress. The bottom line, perhaps, is that this was football politics and democracy working perhaps as it should. It wasn’t the kind of stage-managed FIFA Congress as witnessed in Mexico last May that saw Infantino smuggle in that controversial rule change which allowed Council to appoint key personnel without any apparent due process while engineering the exit of others. Why did that happen? Was it because the members were drugged into semi-consciousness by Infantino’s promise of massive grant increases as part of a future that now looks more politically manipulative than a past FIFA was pretending to shake off? “I think it’s democracy and we need to look forwards anyway,” Infantino told Reuters after the briefest – and no doubt most frustrating – of Indian Ocean stopovers. At last something that can be believed.